They are red, orange or shades in between and tend to invade homes in late fall. Ladybugs and lady beetles are different names for the same bug that some people see as a pest, but I see as a benefit. I don’t have the large-scale home invasion that some people do, so that could be why I see ladybugs through rose-colored glasses. When they do come indoors, I have a spot for them – on my houseplants. My houseplants spend the summer outdoors and are given a good shower before I bring them inside in the fall. 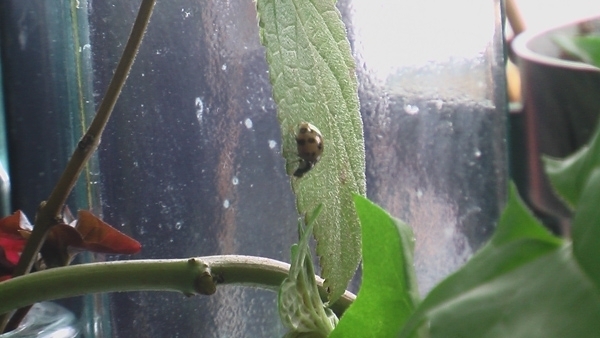 I don’t use any type of chemical insecticide, and that’s where the ladybugs come in: put them on the plants and they spend their days looking for tiny bugs to eat. They’re amazing to watch in action. The Asian lady beetle is present all summer but is most noticeable in the fall when second generation adults migrate from trees, gardens and fields to reflective, vertical surfaces (such as the south side of the house) in preparation for winter hibernation. Asian lady beetles are a beneficial biological control in trees during the summer, and in fields and gardens during the fall, but can be a severe household nuisance during late fall and winter. Wooded residential and industrial areas are especially prone to problems. Asian lady beetles, like other accidental invaders, are “outdoor” insects that create a nuisance by wandering indoors during a limited portion of their life cycle. They do not feed or reproduce indoors; they cannot attack the house structure, furniture, or fabrics. They cannot sting or carry diseases. Lady beetles do not feed on people though they infrequently pinch exposed skin. Lady beetles may leave a slimy smear and they have a distinct odor when squashed. Asian lady beetles follow their instinctive behavior and fly to sunny, exposed surfaces when preparing to hibernate through the winter. The time of beetle flight varies but is usually from mid-September through October (depending on weather.) Light colored buildings and walls in full sun appear to attract the most beetles. Fact: Ladybugs and lady beetles and ladybird beetles are all different names for the same thing. Myth: Asian lady beetles come from soybean fields. Fact: There are Asian lady beetles in soybean fields, but also many other places including trees and, gardens. Myth: Soybean harvest causes multicolored Asian lady beetles to migrate to town and to houses. Fact: Day length and temperatures trigger migration – expect swarms of beetles on first warm days after frost. Soybean plants lose their leaves, and therefore any aphids the lady beetles might be eating long before harvest. The beetles leave soybean fields as the plant leaves begin to turn yellow and not when the combines arrive. Fact: No releases were ever made in Iowa. Multicolored Asian lady beetles arrived in Iowa by wandering from adjoining states several years before the soybean aphid appeared. Myth: Lady beetles breed in the walls of the house during the winter. Fact: They do not reproduce during the winter. Myth: Finding a ladybug brings good luck. Fact: This myth might not be all wrong. Since ladybugs eat aphids, other small insects, mites and the eggs of insects and mites, you could argue that ladybugs do bring good luck to farmers and gardeners. However, there is no evidence to prove that the good luck extends beyond the benefit of fewer aphids feeding on your plants. Myth: You can tell the age of a ladybug by counting its spots. Fact: There are over 5000 different species of lady beetles (ladybugs) in the world and approximately 475 species in North America. There may be as many as 100 different kinds in Iowa. The numbers and arrangements of spots on the backs of ladybugs are distinctive for the different species, and once a lady beetle emerges as an adult it never changes its spots.